As I read internet news today, I have to wonder about the spreading protests in the Arab world. Muslim against Muslim, it seems… the people against their governments in country after country. The headlines and the shouted messages seem to say, the people want freedom. Freedom from corrupt governments, freedom from economic woes, freedom from oppressive rules and regulations. So far we’ve heard about Algeria. Tunisia. Egypt. Jordan. Lebanon. Yemen. Djibouti – yes, that tiny little country too. Worries from Saudi Arabia and Syria. Maybe Kuwait. I did a bit of research into the differences between two major Muslim groups today. Here’s an abbreviated synopsis. Sunni Muslims make up the majority (85%) of Muslims all over the world. They elect their leaders. Sunni = “one who follows the traditions of the Prophet.” Sunni Muslims agree with the position taken by many of the Prophet’s companions, that the new leader should be elected from among those capable of the job. They believe leadership is not a birthright, but a trust that is earned and which may be given or taken away by the people themselves. No basis for veneration of leaders. Shias (or Shi’ites) constitute only 10-15% of overall Muslim population worldwide. Their leaders are appointed by Allah or his representatives. Shia = “a group or supportive party of people.” The commonly-known term is shortened from the historical “Shia-t-Ali,” or “the Party of Ali.” They are also known as followers of “Ahl-al-Bayt” or “People of the Household” (of the Prophet). They believe that following the Prophet Muhammad’s death, leadership should have passed directly to his cousin/son-in-law, Ali. They do not recognize authority of elected Muslim leaders, believe leadership should have stayed within the Prophet’s own family, among those specifically appointed by him, or among Imams appointed by God Himself. Shias follow a line of Imams which they believe have been appointed by the Prophet Muhammad or God (Allah) Himself. Shias believe the Imam – such as Ayatollah Khamenei in Iran – is sinless by nature, and that his authority is infallible as it comes directly from God. They do venerate their leaders. Although Sunni Muslims constitute 85% of all Muslims, Shias form a majority of the population in Iran, Yemen (? – see * below) and Azerbaijan, Bahrain and 60% of the population of Iraq. There are also sizable Shia communities along the east coast of Saudi Arabia and in Lebanon. Does Iran have a hand in instigating the various Arab world riots, working behind the scenes and perhaps using Hezbollah to do it? Bahrain – majority of the population is Shia but the King is Sunni. Extreme violence today as police opened fire on protesters, then blocked ambulances from reaching wounded. Libya – majority Sunni but in 2007 Gaddafi said he wants all of N. Africa to be Shi’ite (in an overture to Iran) – a statement that was considered idiotic by many people in his own country. http://www.memri.org/report/en/0/0/0/0/0/0/2137.htm Protests in Libya turned violent today with a number of people killed and many wounded as the government cracks down on protesters. * Yemen – 52% Sunni, 46% Shia. President is Shia. Prime Minister (appointed by President) is Sunni. Both are men of very bad reputation, associated with Saddam Hussein, terrorists. Dijbouti – 90% of population Muslim, nearly all Sunni. President is Sunni. Has just started having protests in the streets today. All of these protests are for better economic conditions, with food and fuel prices high and unemployment also high. Large populations of young people cannot find work after finishing their education. It doesn’t appear to matter whether the government is by a dictator, elected President, military generals or a monarch, they want the government pulled down. To be replaced by who? How, and how soon? It looks to me like a set-up for a charismatic leader to emerge. It’s going to be an interesting year. To follow events in these and other middle eastern countries, read “Arab Awakening” in The Star online. Hosni Mubarak denies that he voluntarily resigned or passed any powers to the army. “I had no idea Omar Suleiman was about to read out that statement. I would never have signed it or allowed it to be published,” said Mubarak. 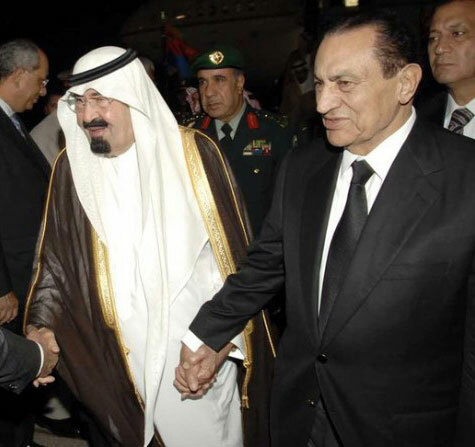 Mubarak has moved vast assets from European banks to Saudi Arabia; salvaged financial fortune with Saudi help. Hosni Mubarak and his family have moved a large part of their assets – guesstimated at between $20 and $70 billion – from European banks to Saudi Arabia and the United Arab Republics against personal guarantees from King Abdullah and Sheik Al Nahyan to block access to outside parties.This is reported by Gulf and West European sources. Tunisian ex-ruler Zein Al Abdain Ben Ali received the same guarantee when he fled his country and received asylum in the oil kingdom. A Swiss financial source commented: “If he had any real money in Zurich, it may be gone by now.” According to debkafile’s sources, the transfers took place on Feb. 12-13. Although a weekend when European banks are closed, high-ranking officials in Riyadh had their managers hauled out of home to execute Mubarak’s transfer orders without delay. The ousted Egyptian ruler was on the phone to Saudi King Abdullah Friday, Feb. 11, immediately after his vice president Omar Suleiman went on state television to announce his resignation and handover of rule to the army. Mubarak called it a military putsch conducted under pressure from Washington. He denied he had resigned or passed any powers to the army. “I had no idea Omar Suleiman was about to read out that statement. I would never have signed it or allowed it to be published,” said Mubarak. The Saudi king voiced understanding for the ex-president’s plight and said the Riyadh government was under orders to meet any requests for assistance received from him. Mubarak views himself still as the rightful president of Egypt. Aware of this, the High Military Council Sunday, Feb. 13, abolished the constitution. Otherwise, Mubarak would have been correct and the military would have had no authority to issue decrees and pass laws without his signature. Debkafile’s military sources stress that all 25 generals serving in the High Army Council can be relied on to raise a high wall against any such probe. Members of Egypt’s high officer class are heavily invested in Egyptian industry, financial institutions and banks, having built their personal fortunes by the same methods as the Mubarak clan and its hangers-on. An exhaustive investigation might also bring to light American and Israel capital interests linked to businesses close to the Mubarak regime. The military will not doubt use its powers under martial law to put a spoke in the opposition’s demand for an inquiry. People power has spoken in the biggest Arab nation just four weeks after Tunisians toppled their own ageing ruler. 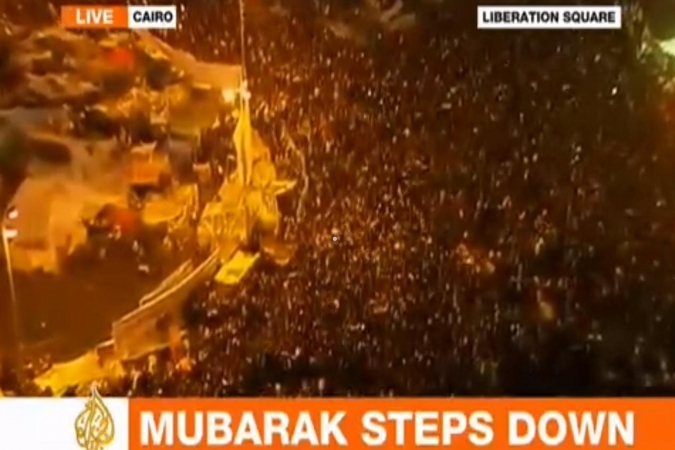 Egyptians have woken to a new dawn after 30 years of rule under Hosni Mubarak. Omar Suleiman, the vice-president, said on Friday in a televised address that the president was “waiving” his office, and had handed over authority to the Supreme Council of the Armed Forces. Suleiman’s 50-word statement was received with a roar of approval and by celebratory chanting and flag-waving from a crowd of hundreds of thousands in Cairo’s Tahrir Square, as well as by other pro-democracy campaigners who were attending protests across the country. After 18 days of rallies at Cairo’s Tahrir Square, resisting police assaults and a last-ditch raid by Mubarak supporters, people packed not just the epicentre but, it seemed, every street and neighbourhood of the capital. Similar was the scene in other cities and towns across the country. Fireworks lit the night sky, cars honked under swathes of red, white and black Egyptian flags and people hoisted children above their heads. Some took souvenir pictures with smiling soldiers atop their tanks on city streets. Everyone cried, laughed and embraced in the hope of a new era. The top figure in Egypt is now Field Marshal Mohammed Hussein Tantawi, the country’s defence minister and head of the supreme council. In its third statement to the nation since Thursday, the council said in a televised address that it was examining the situation “in order to materialise the aspirations of our great nation”. Nezar al Sayyad, a Middle East specialist, told Al Jazeera that Egypt “is in a very critical stage in terms of what is going to happen next. I think it’s extremely important to remember here that although Omar Suleiman made the announcement that Mubarak made the decision to step down, we don’t really know if Mubarak decided to step down or [if] he was forcibly removed by the armed forces and by the supreme council,” Al Sayyad said. Mohamed ElBaradei, a prominent opposition leader, hailed the moment as being “a dream come true”. “I can’t tell you how every Egyptian feels today,” he said. “We have been able to restore our humanity … to be free and independent”…. CHICAGO — A massive storm billed as the worst in decades barreled northeast thorough U.S. states on Wednesday, leaving vast swaths from Chicago to New York paralyzed by snow and ice. Hundreds of motorists were stranded overnight, and airports and schools were forced to close. Chicago had 19.5 inches (49.53 centimeters) of snow, ranking the storm the third-largest on record to hit the city — and still more snow was possible. As much as 18 inches (46 centimeters) fell in Missouri, more than a foot (30 centimeters) dropped on northern Indiana and southeast Kansas, and Oklahoma saw up to a foot. New York City was expected to get up to three-quarters of an inch (2 centimeters) of ice by midday before the mix of sleet and freezing rain warms up to rain. Forecasters warned ice accumulations could knock down some tree limbs and power lines across the storm’s more than 2,000-mile (3,220-kilometer) path. Ice also could affect transit service. The storm was, if not unprecedented, extraordinarily rare, National Weather Service meteorologist Thomas Spriggs said. “A storm that produces a swath of 20-inch snow is really something we’d see once every 50 years — maybe,” Spriggs said. 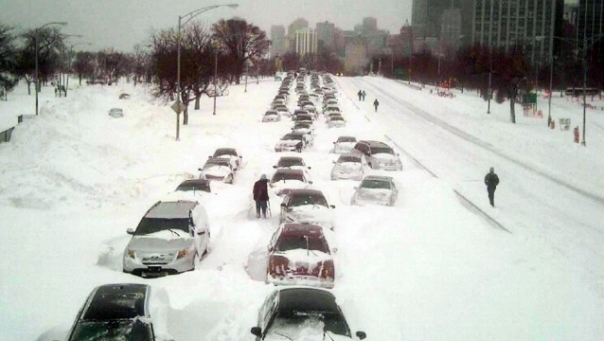 In Chicago, the city closed public schools for the first time in 12 years and shut down Lake Shore Drive, where hundreds of motorists were stranded for 12 hours after multiple car accidents on the iconic roadway. Bulldozers moved snow away from an estimated hundreds of cars that remained buried up to their roofs Wednesday morning, after drivers had been rescued. Only then could tow trucks move in. Not only was driving dicey, but flying in and out of Chicago’s O’Hare International Airport — a major U.S. hub — won’t be possible until Thursday. The decision by O’Hare-based airlines to cancel all their flights for a day and a half was certain to have ripple effects, said transportation expert Joseph Schwieterman. More than 5,300 flights were canceled nationwide, according to flight tracking service FlightAware. That came a day after airlines grounded 12,630 flights due to the storm. More than 200,000 homes and businesses in Ohio began Wednesday without power, while in excess of 100,000 customers had no electricity in New Jersey and Pennsylvania, which were hit with mostly freezing rain and ice. Rolling blackouts were in Texas. In Oklahoma, rescue crews and the National Guard searched overnight for any motorists who might be stranded along its major highways after whiteouts shut down Tulsa and Oklahoma City. The storm’s powerful punch came from cold air that swept down from Canada, clashing with warm, moist air coming up from the south, explained National Weather Service meteorologist Gino Izzo. A huge storm has crashed into northeastern Australia, ripping roofs from buildings and cutting-off power to thousands of homes. Officials have said Cyclone Yasi is likely to cause destruction on a huge scale and probably some deaths. It has been measured as a category five storm – putting it on a par with Hurricane Katrina, which devastated New Orleans in 2005. 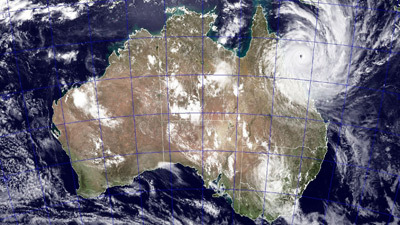 The destructive core of the storm swept in from the Pacific before hitting land at about midnight local time (2pm in the UK). Experts say it will be several hours before the winds ease. The massive weather system is 310 miles (500km) across, with the eye alone measuring some 60 miles (100km) across. Gusts of almost 190mph (300kmh) are expected. A volcanic eruption in southern Japan has delayed international flights and shattered windows more than 10 kilometres away. The 1,400-metre Shinmoedake volcano has been belching out smoke and ash since last week, the start of its first major eruption for 52 years. But the eruptions have grown more intense in the last 24 hours, with one gigantic blast shattering windows 12 kilometres away…. Officials in southern Japan have urged more than 1,000 residents of a town near an erupting volcano to evacuate amid reports of large rocks falling in the area. 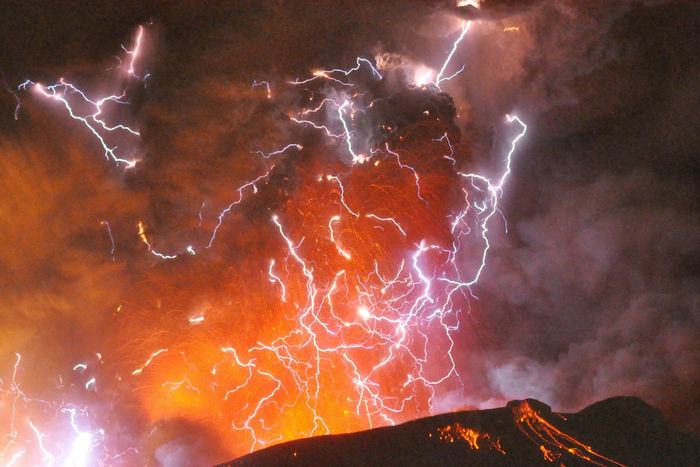 Mount Shinmoe’s first major eruption in almost 200 years is sending plumes of ash and rocks kilometres into the sky. The eruption, on the southern island of Kyushu, has disrupted flights and train services and sparked warnings about another, even more powerful blast. Vulcanologists say a giant lava dome on the volcano has now grown to more than 500 metres in diameter. For some people living near the volcano it is nothing more than a nuisance, but for others it is like a biblical curse.